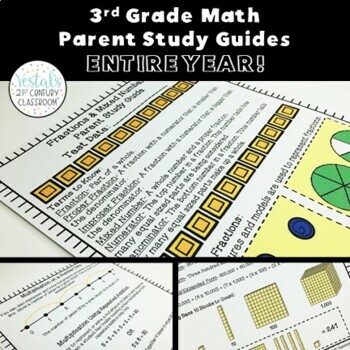 3rd Grade Math Parent Study Guides Bundle- ENTIRE YEAR! All parents want to help their children be successful but sometimes they need a little help too, especially when it comes to math. 3rd grade math is challenging and since my first year teaching I would constantly hear parents say, "The way they teach math now is different than the way I learned it." So, I began making these parent study guides to show parents the way I was teaching concepts in class and to provide step-by-step instructions for difficult concepts. I constantly have parents tell me thank you for sending these home and how helpful they find them. Parents have said these study guides help them make sure their children are completing their math homework correctly and ensure that their children are studying for tests. Now, I have bundled all my 3rd grade math parent study guides together! 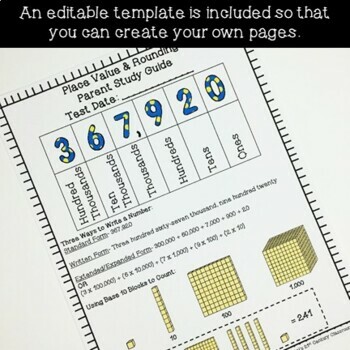 3rd Grade Math Parent Study Guides Bundle comes with 21 study guides aligned with 3rd grade Common Core and Virginia Standards of Learning. Each study guide is 1-3 pages. An editable template has also been included so that you can add any additional tips or specific strategies you use for teaching skills. This resource has been updated to reflect the 2016 changes made to the Virginia Standards of Learning. If you like this product, please follow my store by clicking the green 'follow me' at the top of my store page. This will keep you up to date with the latest sales and freebies in my store. Thank you!